These limited-edition bags, designed by Anna Violet and Tom Biddle (and modelled here by James and Ludo from Epicerie Ludo) are a handy fold-away for your bag or pocket, saving you 5p for sweets not plastic bags. Even better, every penny raised from the sale of bags goes towards maintaining Chorlton's flowers - the beds, herbs, window boxes, bike racks and planters. We've had funding help from Manchester City Council for the containers and initial plantings, but that can't continue, so we're looking after things ourselves. Carry this bag and show your support. If you can manage a bit of dead-heading or litter removal from planters too, it would be much appreciated, if you're passing! 100% unbleached cotton, the bags measure 37cm x 40cm. Keep local money where it belongs - locally! These vouchers can be redeemed in payment or part-payment with traders on the Chorlton map or listed here. You could pick up some wonderful food and drink, individual and thoughtful gifts, a new life experience, a bit of a pamper or donate it to charity. 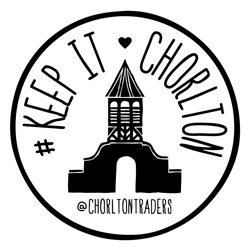 The perfect gift for everyone who loves Chorlton? More Chorlton! Please note that change cannot be given when vouchers are used to buy items worth less than £10. 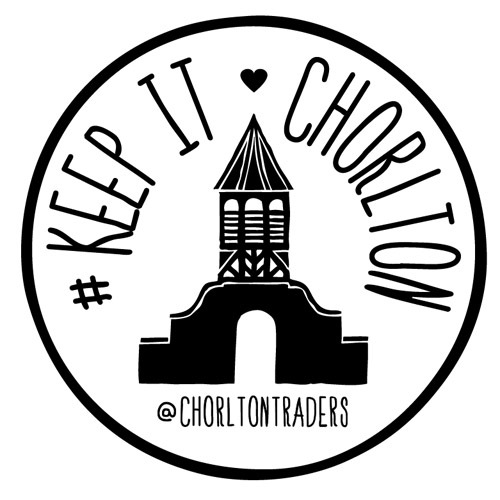 A complete guide to all the lovely things in Chorlton and just where you'll find them. Designed by Tom Biddle and featuring illustrations by Anna Violet, the map lists local traders, parks and landmarks, markets, festivals, and even places to park your bike. It's Very Chorlton Indeed. The map was produced by the Chorlton and Beech Road Traders Associations with help from Manchester City Council and Chorlton Civic Society. It's free to all good homes, just pay £2 for shipping. Please note - if you'd like more than ten maps, or a stock for your customers, please email us instead. The 2019 TAG! card rewards you for shopping locally with deals that you won't find elsewhere. The card is valid until 31 December 2019 and will pay for itself in no time. Just look out for the TAG! logo when you're out shopping and show your card before you pay. For a list of local independents that have TAG deals on offer, visit the TAG website.